Fuse Specification – Act Fast, or Take Your Time? Fuses provide critical protection to electrical systems and the properties those systems serve by opening circuits to shut down the flow of electricity when dangerous overload and short-circuit conditions occur. But sometimes this protective behavior can become a nuisance, as when standard inrush currents trigger a fuse to blow. For these applications, time-delay fuses combine needed protection, while allowing the brief overcurrent conditions that occur when motors, lighting ballasts and transformers start up their operations. The alternative to using time-delay – also called “slow blow” – fuses, requires specifiers to design panels for oversized fuses to serve circuits with inductive loads. For example, a fast-acting fuse might need to be sized at 300% of an ac motor current to handle temporary overloads as the motor starts up. This practice can lead to larger-than-necessary panels and less-than-optimal short-circuit protection. Many time-delay fuses operate by incorporating a second fusing element – generally, some sort of spring – that specifically handles short-term overcurrent conditions. The primary fuse element remains in place to rapidly shut down operation should a short circuit occur. In this way, time-delay fuses can handle temporary power surges while still remaining sensitive to high-amperage short circuits, so they can be sized more closely to actual motor loads. Fast-acting, single-element fuses remain critical players in overcurrent protection designs, however. 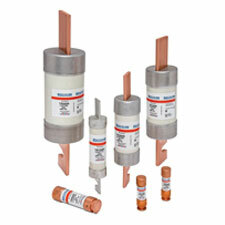 They can be the better choice for circuits without surge-prone inductive loads. In such applications, fast-acting models can protect downstream equipment that might be sensitive to overloads, over time. And by reacting before individual, equipment-level fuses blow, they can save the time that might be needed to get that equipment back online.